Oh, the things you can find on eBay. Comics readers still have fond memories of Bill Watterson’s Calvin And Hobbes, the whimsical 1985-1995 strip that detailed the adventures of a rambunctious young boy and his best friend, a stuffed tiger who came to life in the lad’s vivid imagination. Fans may have fewer fond memories, however, of Calvin And Hobbles by the elusive Bill Waterson. This tiger-free comic strip detailed the odd, ungrammatical adventures of a king-sized, spiky-haired child and his incredibly irresponsible, laissez faire parents. Some original Calvin And Hobbles artwork sold recently on eBay for the shockingly low price of $2.25. The seller’s description is terse but intriguing: “Calvin and Hobbles by Waterson. Mike Sellers was the inker for many art work artist from that era. 16x20 poster board. Signed by Mike Sellers who did the ink work.” Interestingly, no questions were posted about this one-of-a-kind item. 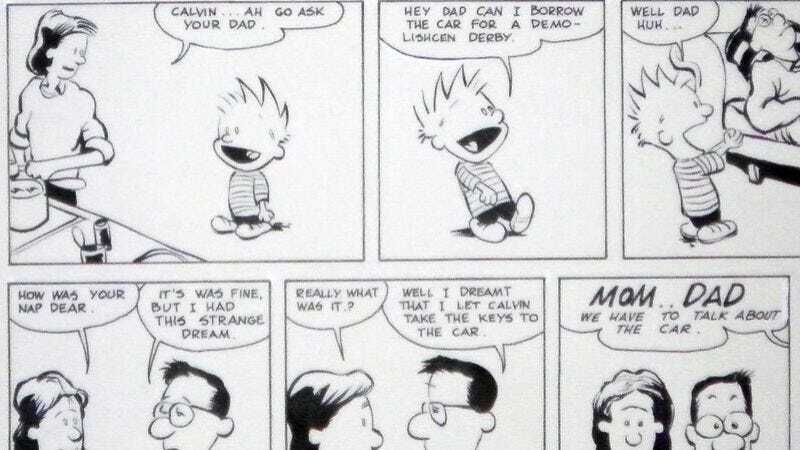 The lucky bidder won what appears to be the artwork for a black-and-white Calvin And Hobbles Sunday strip in which the monstrous Calvin casually asks his parents to borrow the car for a “demo-lischen derby.” The child’s mother calmly defers to her sleeping husband on this issue. Dad, in turn, absentmindedly hands Calvin the keys to the vehicle, thinking the whole incident is merely a dream, a notion which Calvin later dispels by destroying the car and emerging dazed and charred from the wreckage. Truly a surreal and disturbing incident, especially for the funny pages. And all this for $2.25. UPDATE: A Facebook user named Mike Sellers has now claimed credit for the unauthorized imitation of Calvin And Hobbes, “crappy lettering” and all. According to Sellers, it was a senior year assignment from his days at New Jersey’s Kubert School. Apparently, this was from a portfolio which went missing years ago and has now strangely resurfaced on eBay.